Click here to download the Preview Client. techdb is a Helix Client/Server database that we use to provide technical support to our customers. In techdb you can search our knowledgebase, look up Helix error codes, submit bug reports & feature requests, chat with other Helix users, and more. In essence, techdb is a live demo of Helix Client/Server in action, and it provides a communal gathering spot for Helix users around the world. That alone makes it a worthwhile part of our technical support services. Bug Reports & Feature Requests: users submit reports, request features and discuss them with other Helix customers and with our staff. HelixChat: a live chat forum that is open all the time. Knowledgebase: a searchable record of tech support calls where you can find the answers to many questions. Error Codes: if your Helix collection crashes, find out what that error code means. Surveys: see the results of the various survey we conduct. 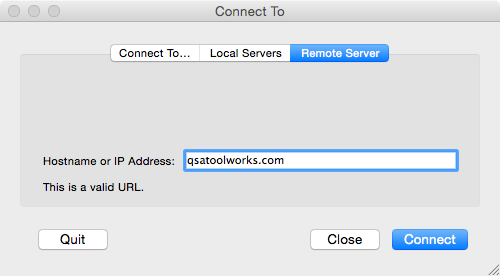 First Connection: Choose the Remote Server tab — it may be displayed automatically — and enter qsatoolworks.com in the ‘Hostname or IP Address’ field and click the Connect button. Reconnecting: After your first connection to techdb, it appears in the Connect To… panel when the dialog opens. Choose it from this list and click Connect to quickly reconnect. Reconnecting takes you right back to where you were, reopening windows in the positions you last left them. See this technote for more information about the Connect To dialog. Once you have contacted the Server (this may take a few seconds) you will be presented with the user authentication dialog. Your Username is guest and no password is required. Note that this collection has ‘User Name Security’ turned on. We strongly recommend that collections served over the internet have this important security feature turned on. Otherwise unwanted visitors may find your server and access your data. Remember: this is a Helix database you are logging in to. You must authenticate using the guest username to access the database. (We aren’t going to create unique users for each of you!) Once logged in, you can use your Access information (next section) to uniquely identify yourself within the database, but authentication is always done as guest. It provides a way for you to be personally identified when participating in HelixChat, reporting bugs, etc. It provides security for your Helix account. Once you have set an Access Password, that password is required to log in to the Helix Web Store. Registration is not required to browse content, but is if you want to report bugs or participate in HelixChat. Customer #: Required. Your Helix Customer Number. Your Name: Required. Your full name, as provided when you created your Helix customer account. Chat Name: Required. The name you prefer to be identified by when participating in discussions. Avatar: Optional. A small graphics file (GIF, JPEG, PNG, etc.) that represents you in discussions. The Customer Number you entered in the Access Password Registration form is compared to the name you provided and, if there is an exact match, you are immediately granted full access to techdb. Otherwise it must be reviewed and approved by our staff before you can contribute to techdb. (Feel free to send us an email asking us to expedite this step.) In the meantime, you can familiarize yourself with techdb, review existing entries, search the reports… everything except contribute. Once you have successfully registered, you are a full-fledged member of our online community! If you are familiar with Helix, getting around in techdb should be very familiar to you: after all, it is a Helix collection. Be sure to check out all of the options that are available. And don’t forget: on many Friday afternoons (US Eastern Time) members of the QSA ToolWorks staff drop by the HelixChat window. If you want to talk directly to us, this is a great way to do it. Some people have reported initial trouble connecting to the database. Our investigation reveals that this is caused by confusion related to the purpose of the Access Password. Some people thought that creating this somehow creates a new user in our Helix database that you must then use when you re-connect to the collection. That is incorrect. 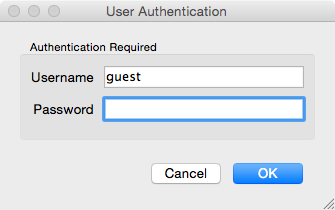 You always authenticate using the guest username to access the database. 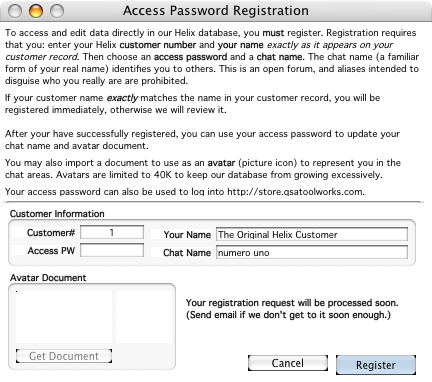 Once logged in, you use your Access Password to uniquely identify yourself within the database, for example when reporting bugs or participating in HelixChat. But when the User Authentication window opens during the initial connection, you always log in as guest, and the guest user has no password.